»An Enchanting Day in the 'Ooty of Andhra Pradesh'! An Enchanting Day in the 'Ooty of Andhra Pradesh'! Anyone would want a break from the hectic work schedules. Ofcourse, weekends are the life-savers which allow us for quick trips. Especially, a less-crowded spot away from the traffic and pollution is most preferred. So, here we go to the peaceful Horsley Hills in Andhra Pradesh. This hill station is best suited for a one day trip or a weekend stay. Horsley Hills is an ideal spot to laze around and spend some quality time with your dear ones. Here you will get ample time to feel the nature at its best and enjoy the pollution-free environment. All you need to do is park your vehicle at one spot and stroll around the tranquil hill station. Horsley Hill is the anglicized name of Yenugu Mallamma Konda. Yes, one legend says that an old woman named Mallamma lived atop the hill and she was fed by the elephants everyday. Hence, the name Yenugu Mallamma Konda; 'Yenugulu' means elephants and 'Konda' means hill. Later, a British officer named W.D.Horsley built a bungalow and lived there. So, the hill station was named after this British personnel. Horsley Hills is a place for a relaxing stay; here you won't have any pressure of covering too many tourist attractions. The hill station has a few tourist places like Horsley's Bungalow, Horsley Hills Environment Centre, Governor's Bungalow, the Nature Centre and a few View Points. Horsley's Bungalow is elegant and you can take a stroll inside. Though most rooms are locked, you can get a glimpse of the interiors. Next head to the Environment Centre which is one of the main tourist attractions in Horsley Hills. There is a mini zoo with a deer shed, emu and so on. You can also visit the crocodile tank nearby. Governor's Bungalow is used by the resort for the accommodation purposes. Moving on, a short distance walk to the view point is worth all the time. You can get a panoramic view of the surrounding regions and the distant hills that look scenic. There are a few other view points which you can explore. Horsley Hills has one main resort named Haritha Resort which has the one and only restaurant in the hill station. Here you can also try some adventure activities like zip-line, rope activities, etc. Other than these, Horsley Hills has nothing much to explore. All you have is the serene landscapes, a number of birds (be ready with binoculars), cool weather, canopy of trees, yellow blossom of flowers covering the green forests. Therefore, this hill station is best to be lazy and rejuvenated! Horsley Hills is a year-round destination. However, the time from September to January is the best time to visit Horsley Hills. Haritha Resort is the only good accommodation on top of Horsley Hills. Otherwise you have to stay in Madanapalli at the foot of the hill. Horsley Hills is one of the offbeat destinations located near Bengaluru (Bangalore). It is around 145km from the Bangalore. 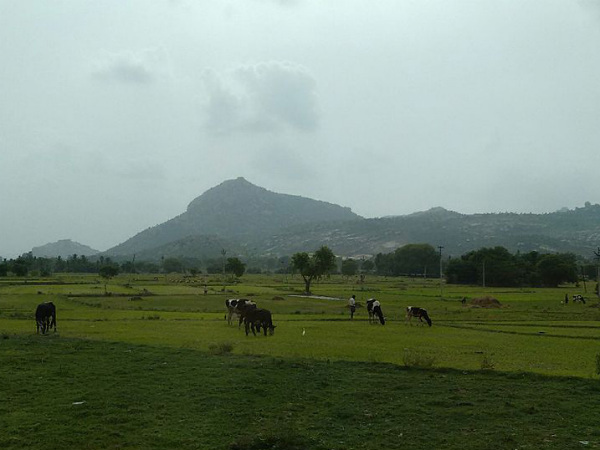 Horsley Hills is located in Madanapalle of Andhra Pradesh and it is well-connected to other places. By Road: Take Bangalore - Tirupati Highway and take diversion towards Chintamani to head to Madanapalle. After almost 5-6 hair-pin bends through the scenic ghat section, you will reach Horsley Hills.